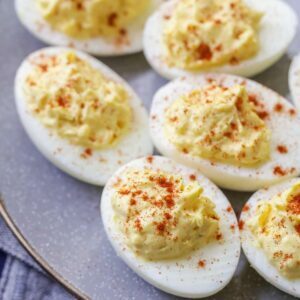 Nothing better than a smooth deviled egg appetizer! You'll be surprised with how easy these are to make. Tons of flavor, super delicious and perfect for parties and holidays. Place eggs in a pot of cold water. Add a pinch of salt and vegetable oil. Bring to a boil and let boil for 10 minutes. Remove eggs from stove and place in ice water to cool. Carefully cut each egg, lengthwise, removing the yolk to a small bowl. Set the white of egg aside. Add mustard and mayonnaise to bowl and whip with a fork. Salt and pepper to taste. Spoon mixture into the hole of each egg. Sprinkle with paprika. Place in fridge until ready to serve.